Born in St Helens Merseyside, at a very early age Judy was encouraged by her mother and elder sister (both talented amateur artists) into sketching our varied assortment of pets. Ponies arrived later courtesy of a local riding school. After leaving full time education she went to art college, departing after just two weeks to the obvious delight of her tutor! The next few years were spent as a groom at Barleythorpe stud, as well as various hunting, showjumping and livery yards, using her charges as equine models when time permitted. Fast forwarding through family commitments and a few years spent in Hong Kong where her paintings became re-invented upon the discovery of "George Stubbs Anatomy of the horse". 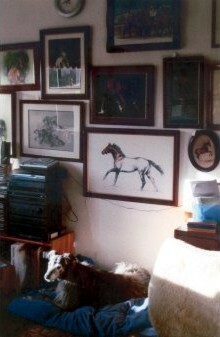 Back in the home in the UK Judy took up painting full time which paid for a sucession of horses, the last one a three quarter thoroughbred was with her until the ripe old age of 34. Her work can be seen at exhibitions, galleries and at National and International horseshows; much of her work is commissioned by corporations and private individuals. “King's Rhapsody” was a painting gifted to Her Majesty the Queen Mother by Judy and then subsequently donated to the Moorcroft Race Horse Welfare Centre, the retirement home of Her Late Majesty's favourite horse, to be auctioned to raise funds for the centre. In October of that year it realised the fabulous sum of £3,000. This is Judy's favourite place, it is so easy to work there and the light for most of the day is perfect. Not only is it a great workshop but also a wonderful showcase for her prints and original artwork, where prospective clients can view the medium that might best suit their horse or dog or other animal.